I sometimes wonder how other scrappers plan a LO and how they go about setting up and selecting their papers and embellies......... It can sometimes take me longer to plan a LO than to actually put it together. It was especially stressful before my darling husband gave me a gift of a custom made scrapping cupboard. Having 3 young kids at home meant that I always had to pack up all my scrapping goodies when I was done. I could never leave things over-night and come back to a LO the next day for fear of my munchkins getting their little greesy paws on my precious scrapping goodies. But now with my great new flip top desk, which I designed myself, I can work on a LO as long as I need to because once I'm done for the day I simply close up the desk and no-one can see or touch my mess........YEAH!!!! Here's the desk with the top open. As you can see it's about 2.5inch deep with a top that closes up to hide all the mess underneath. I also put a cork board up so I can pin up several embellishment options while I'm in the planning process. I keep all my tools in the top drawer, all gems, thread, beads, and metal embellies in the 2nd drawer. I also have drawer for all my stamps and then one drawer is just for scraps/leftover papers so they're close at hand when required. This is a side view of the entire unit. There are cupboards above the desk as well as a great walk-in corner units that I've packed all my albums and embellies in. there is also some display shelves along the one side of the unit that I keep pics of the kids and my wedding. There is also a flourescent light above the desk which I love because now I can work late at night without straining my eyes in dim lighting which is the problem I used to have. This is the inside of the corner unit. I have all my old Photograph albums in here too so I can easily browse through them when I'm in the mood to scrap an old photograph. I also still put any pics I'm not up to scrapping in regular albums. That was until my hubby bought me this great digital frame. Now I only print pics I want to scrap,the rest get put onto the digi frame. The printed boxes house various embellies which are now easily accessible. As you may have noticed, I have a flower fetish!!!! I LOVE flowers and consiously have to stop myself from buying more until I've used up at least half of my existing stash. I bought these cheap "sweet jars" from the plastic factory shop and sorted all my flowers by colour. I also have tons of other plastic containers filled with all sorts of embellies. From butterflies sorted by colour to punches and other small tools. i have my mists, liquid pearls and stickles easily accessible too. When the contractors were making the cupboard I asked them to install several rows of hooks in the corner cupboard which I use to hang all my ribbon from. It's all colour coded so now it's so easy to pick out a piece of ribbon for a LO. Once selected I simply cut the length required from the end without even having to remove the ribbon from the hook. Wow...how jealous am I of that scrap desk! I literally scrap in a little corner of my bedroom. I can never leave anything just hanging around either...I'm looking forward to the day I can have a lovely desk like yours! Thanks for sharking your process and your scrap space! Wendy, that is awesome!!!! I love your table and the way it is set up ready to do your next fabulous page!!! I must admit, having my own room is glorious, I remember the days of packing everything back into plastic containers to clean the dining room table. lol...Love your space!! That scrap desk rocks!! How very cool!! Having your own area and a place to "hide" your stuff makes all the difference doesn't it? 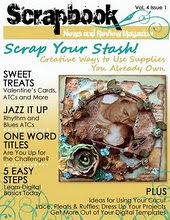 Your scrapspace looks so fab! What a great hubby and what wonderful place to scrap! Great desk and fabulous idea. WOW..you did a great job designing that and your space looks very well organized and fun!